Gov. Bruce Rauner speaks to his supporters after he was elected governor of Illinois on Nov. 4, 2014. 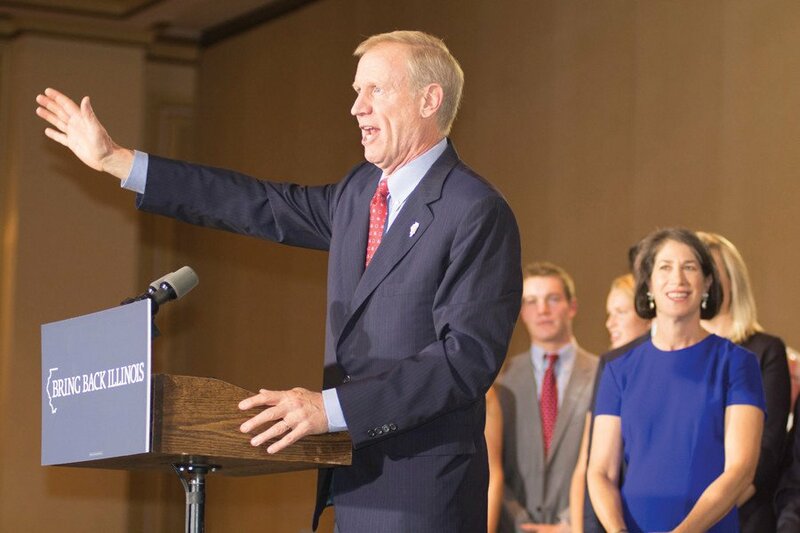 Rauner said he was "very upset" after Attorney General Lisa Madigan filed a filed a motion Thursday to halt pay for state employees until lawmakers and Rauner reach a budget agreement. Illinois Attorney General Lisa Madigan filed a motion Thursday to halt pay for state employees until lawmakers and Gov. Bruce Rauner reach a budget agreement. The motion, filed in St. Clair County Circuit Court, asks the court to dissolve by Feb. 28 an order in place since July 2015 that has required state workers to be paid during the ongoing budget impasse. The February deadline should give Rauner and lawmakers “additional time to enact appropriations legislation and thereby ensure that state employees will continue to receive their wages,” according to the filing. “While initially intended to avoid the risk of a state government shutdown as the Governor and General Assembly continued to negotiate a budget, the court’s order has removed any imperative for the executive and legislative branches to fulfill their basic constitutional obligations and resolve their budget impasse,” the motion reads. Madigan cited in the motion an Illinois Supreme Court ruling from last year, which said the state did not have to pay back wages to state workers because legislators failed to appropriate enough money to do so. Illinois has been without a full-year budget since July 1, 2015, which is the longest any state has gone without a spending plan since World War II. State senators failed to vote Thursday on a budget compromise organized by Senate President John Cullerton (D-Chicago) and minority leader Christine Radogno (R-Lemont), but Cullerton said lawmakers plan to vote on the deal after they return to Springfield on Feb. 7. Rauner said Friday he is “very upset” at Madigan’s motion, saying it would hurt state employees and their families. The motion was filed one day after Rauner’s State of the State address in which he expressed optimism in reaching a budget deal. “I hope the attorney general will reconsider this move, and let’s not block the great work that the Senate is doing to come up with a compromise and a truly balanced budget,” Rauner said. The American Federation of State, County and Municipal Employees Council 31 said in a statement it is prepared to fight Madigan’s motion. To protest Rauner’s terms for a budget deal, state employees, according to the AFSCME statement, will hold a “strike authorization vote” in their local unions between Jan. 30 and Feb. 19 to give their bargaining committee the power to call a strike.